Welcome and thank you for participating in the Tornado Alley Spring Classic. Our hope is to provide soccer players and their families with a fun and memorable weekend. The BASC Tournament Committee wishes the best of luck to all teams participating in the tournament! Read and Understand before Arriving. Premliminary Schedules - Preliminary schedules will be posted closer to time of the tournament. An email will go out to coaches saying they are ready to be viewed. Check-in Requirement - All teams need to check in at one of the three check in times. Local coaches/managers need to check-in at tournament headquarters either Thursday or Friday Night, 5:30pm - 7:30pm. If you have a game on Friday night, you need to check in on Thursday. Traveling teams (requiring a hotel for tournament) need to check in at tournament headquarters at either of the two times above or Saturday morning between 7am - 9am. If you do not check in, your team will not be eligible to play. If you are a BASC team, we will print for you. Must have 2 official stamped copies of team roster guest player is currently registered on. For U11-U19 players, bring current seasons player passes, (if your club requires them). Official Rosters must have a player jersey number for each player. You may hand write the number on your official roster if they are not already typed in. OSA registered teams: Team Coach or Manager must fill out & submit guest player form before a guest player can attend the tournament. Click Here for online form. Bring a copy of form to tournament check-in to verify you have filled out appropriate paperwork with OSA. If BASC player, email player’s name & team name to tournament@bascok.com and we will print player’s roster. If player is not a BASC player, you must obtain two (2) copies of the guest player’s primary team’s official stamped/signed roster showing they are registered in a current league. 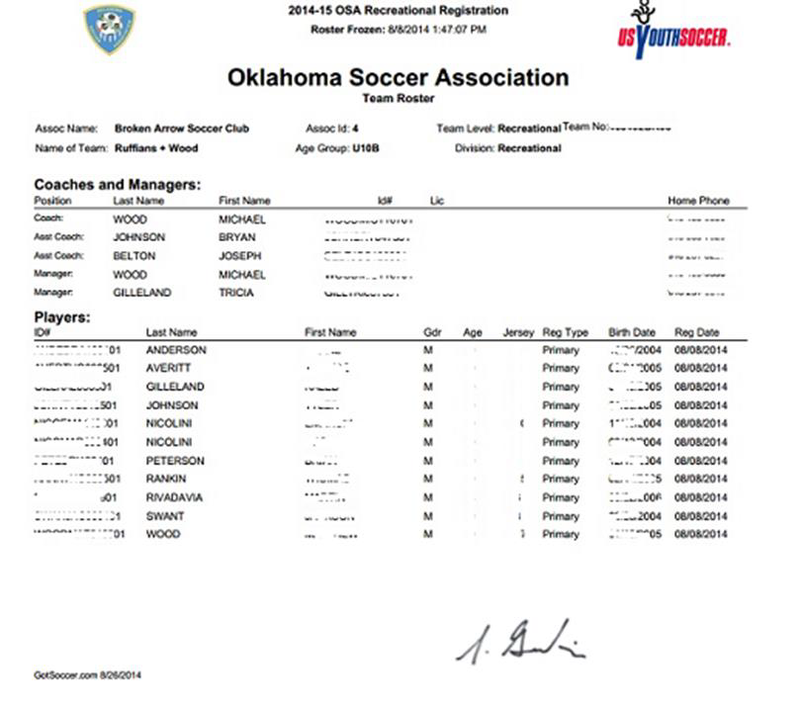 Official rosters will have the USYS or AYSO or USSSA or US Club affiliation stamp on roster. 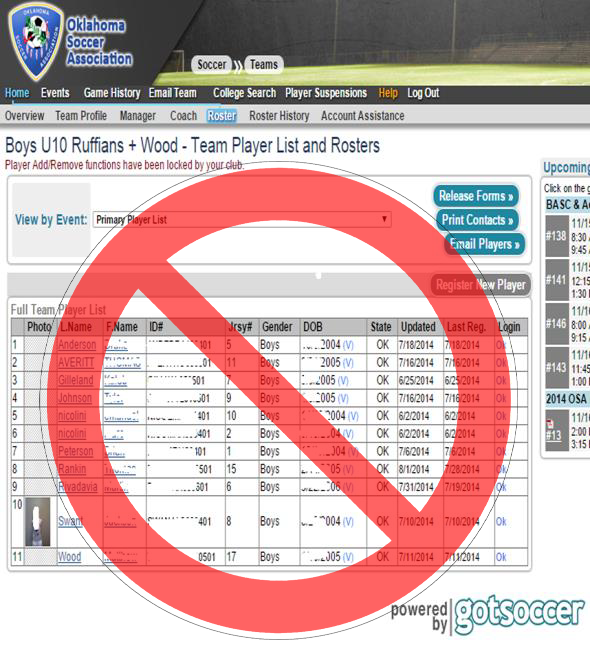 GotSoccer rosters will not be accepted, you cannot bring a roster that is printed out from the GotSoccer roster tab. If you are not sure, ask your club president or club registrar to print this for you! Player pass if required in their current league - Must supply the guest player's player pass if the league they're playing in has player passes. Click Here to read OSA Guest Players Policies & Procedures. TOURNAMENT LOGO WEAR - Get your official tournament wear customized with US Signs & Screenprinting near the Gazebo on the east side of the complex.